The Durban based Umsindo Theatre Projects is presenting Daffi Falls at the National Arts Festival in Grahamstown. 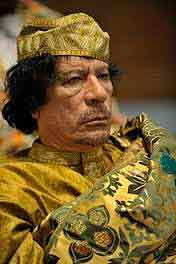 This is a story about the life and times of President Muammar Gaddafi. The story is told by a journalist who is obsessed with Gaddafi’s life story and mirrors it with his life. The story starts with Gaddafi’s last moment, he wakes up full of blood asking what happened to him The journalist helps him remember. The story is told through powerful music, drama, images, multimedia and poetry. The drama is written and directed by Musawenkosi and Bongumusa Shabalala with music by Sandie Mpungose. It features Kwenza Ngcobo, Celestia Mpanza, Buhle Maphanga and Mduduzi Nombela. There will be performances of Daffi Falls on July 7 at 12h00 and 20h30 and July 8 at 14h00 and 20h00 in the Glennie Hall in Grahamstown.